I've finally recovered from my trip to the DW on Saturday. It was such a great day and has only gone to prove a few opinions I had before we smashed Wigan 4-0. Gooners are a great bunch of people and those traveling away with the team are some of the finest. From the moment we joined the M6, we were spotting some of the 6,000 other supporters heading towards the Dave Whelan stadium, with their red and white scarfs placed in the rear window to give away the fact they followed Arsenal. In good time we made it for pre-match drinks in the Red Robin, a stones throw from the ground. And as we entered said establishment, we could hear from the singing that said Gooners were in top form. There we joined in the singing as the bar maid became the centre of some singing, especially the young lady who had red hair. Pints drunk and we were off to the stadium to catch the last of the Chelsea game and to get some food in. The meat pie seemed a sensible option and with a coffee it certainly warmed me up, as it was freezing in the north west. Winter had certainly arrived and the wind was a killer. The north stand where the Gooners were stationed filled up nicely but interest in the TV game soon ended as Newcastle gave away another goal. Then it was back to the singing as we prepared for the match we had all come to see. The stadium isn't bad. Four stands which are one tier and I would imagine offer a good view where ever you sit. We were in the stand behind the goal which Arsenal defended first half and attacked in the second. Arsene Wenger made two changes from the side which drew with Fulham. Koscielny and Gervinho coming in for Djourou and Arshavin. Wigan began the better side but inside half an hour the Gunners had taken the lead. A shot from Arteta which should have been saved by Al Habsi went through the keeper and into the back of the net. We celebrated and inside 90 seconds were were jumping up and down again as the Spaniard's corner was headed home by Vermaelen. During the first half what stood out for me who the boss is in this team. Mikel Arteta. The Spaniard is the player who bosses all his team mates around. The first to tell them off if they've miss placed a simple pass but also the first to offer them encouragement. He's the one who does allow for any sloppiness. You give 100% or else Arteta will be having a word. We controlled the rest of the half and went in with a two goal lead. The stadium announcer tried to inspire the home crowd to give their team their full backing with the words that Wigan had come back against Arsenal twice before when in this position as the teams took to the field for the second half. This season though it would be different. The Gunners have a steel about them and we wouldn't be going down the well worn DW path of slipping up here. Wenger's men were creating all the chances and Martínez men were dire. What didn't help was the lack of support they received from their own fans. Arsenal come to town and you expect the stadium to be a sell out. That wasn't the case as there were hundreds if not thousands of seats which were empty. Outside the ground the club were offering their games against us, Chelsea and Liverpool as a three game package for an adult ticket price of £59. They had half season tickets available for £159. But it was us Gooners who were creating all the atmosphere, if you couldn't hear it from the television coverage. And we were celebrating again as a 33 pass move which Gervinho started finished with the Ivorian finding the back of the net. The game was missing a Robin van Persie goal. After all, Arsenal are a one man team. The perfect opportunity for the Dutchman to open his account of the afternoon fell his way but he fluffed his lines and sliced his shot wide. But we wouldn't go home without seeing the Dutchman get his name on the score sheet. The goal was created by Walcott who pulled the ball back for van Persie to slam home and instead of taking the celebration himself, the Arsenal captain pointed to Theo as a chorus behind the goal went up: "Theo, Theo, Theo." And so a new song was born. "He scores when he wants! He scores when he wants! Robin van Persie, he scores when he wants!" Wenger made a triple substitution bringing on Coquelin, Arshavin and Benayoun for Song, Walcott and Gervinho and there was one last chance which fell to the Israeli international but his goal bound shot was cleared off the line. At full time the team made its way to the stand full of their own fans and van Persie, Mertesacker and Song threw their shirts into the crowd. 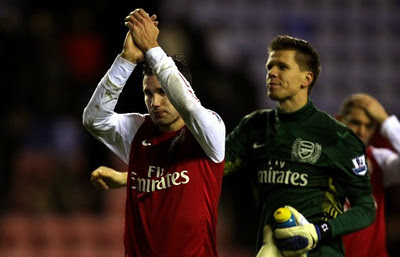 The final moment of fun for the afternoon was made by Szczesny who was last down to applaud us Gooners. He arrived and put his finger to his lip to indicate he wanted our silence. As we quietened down, he began to sing at us "We're by far the greatest team, the world has ever seen and it's Arsenal..." and then we sang back. You cannot accused this Arsenal team of not having pride in the shirt. What we've lost in quality in Fabregas and Nasri we've gained in character quality in Arteta and Szczesny to name just two. That Szczesny moment capped off a brilliant afternoon for me. My first away game of the season and a 4-0 win. Can you ask for more? As we made our way from the ground, we were stood waiting to cross the road as the Gooners in the Red Robin - 500 metres away - started to make themselves heard again. It's far to say that a few of them would have had sore heads yesterday morning. "Wigan started well, created some dangerous situations and surprised us at the start. After that 15 minutes we took control of the game and never looked like losing that. Maybe a bit in the first five minutes of the second half. But overall we had a good team performance defensively and offensively. "The confidence is there and you could feel that in the way we played today. I can only congratulate the team. They are growing and they are getting better and better. You could see there is something there to work on." For some extra reading, Joss Bennett looks at Mikel Arteta's performance in the Wigan win in our latest Inside The Formation post. In other news, Arsenal have been drawn against Leeds United in the third round of the FA Cup. There is talk of Emmanuel Frimpong heading to Wolves on loan in January in the Sunday Mirror. Later the manager will take what is sure to be a second string squad to Greece to face Olympiacos tomorrow in our final Champions League group game. We should get details of who will be traveling when the manager sits down with the media before the team fly out later.